Residential property vendors all over the UK are dropping property prices in a bid to attract willing buyers during the traditionally quiet winter months, good news for residential property buyers but very good news for property investors purchasing using Buy To Let Mortgages, with the biggest property price falls being observed in the regions outside London. According to popular property portal, Rightmove, UK residential property asking prices have fallen by 1.7% during November 2014, seen by some commentators that the UK property market has begun to stall rather than the traditional property market slowdown in winter. But the traditional November drop in residential property prices is the smallest observed for the last five years and the underlying demand for residential property remains strong but has been muted by higher prices stretching any potential buyer’s affordability, making the situation very tempting for property investors looking to expand rental property portfolio’s using buy to let mortgages. North West – Property prices down by 3.3 per cent. 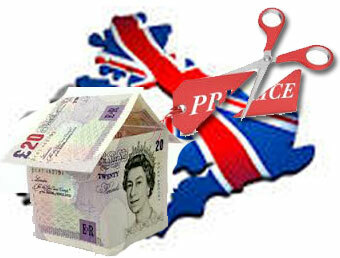 Only two UK regions witnessed a property price increase last month. East Anglia - up 0.7% – average asking price of £248,205 (GBP). Year-on-year property asking prices have risen in every region in the country with London continuing to lead the way, although some estate agents report the market in the capital has seen a distinct cooling since the summer. 2014 to date has been the highest 12-month period for property transaction volume since 2007, with more and more property investors acquiring suitable rental properties using an abundance of buy to let mortgage products now on the market. Residential property buyers face more stringent financial obstacles to get over since the introduction of the Mortgage Market Review back in April, and the Council of Mortgage Lenders (CML) stated that the number of home loans approved by banks and building societies had fallen for the second month in a row in September, as lenders conduct tougher checks on a borrowers affordability and personal finances. Buy to let mortgage lenders are beginning to adopt the practice of using affordability stress tests to ensure property investors can repay buy to let mortgage loans even if interest rates rise by 3 percentage points, personal finances are still taken into account however potential profits are also considered. This was written by Mike Clarke. Posted on at 11:30 am. Filed under Buy To Let. Tagged 2007, 2014, ability to borrow, average property asking price, average property price, buy to let, Buy To Let mortgages, CML, council of mortgage lenders, demand, encourage more property investors to get into property, finance 4 landlords, GBP, good news, London, market, Miles Shipside, mortgage market review, North, North west, property, property investors, property market, property portfolio, property prices, property values, prs, regions, rental yield, residential property, Rightmove, selling, selling property, sim sekhon, slowdown, South West, tighter mortgage lending criteria, UK, vendors. Bookmark the permalink. Follow comments here with the RSS feed. Both comments and trackbacks are currently closed.